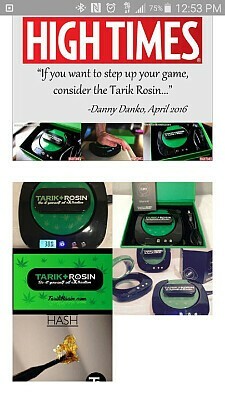 Tarik Rosin aka the "T-REX" is the original Do-It-Yourself at home Oil Extraction machine. Some call it a hair straightener 2.0, say it looks like an old school cd-player, or even looks like a threat to the BHO industry....others wonder why we use "T-Rex" to refer to it or what is "Rosin"...but all who have seen this Rosin Extraction Press in person seem to agree that this little machine is pretty amazing. Within a couple minutes, you can take high grade flower, wrap it in Parchment Paper (never wax paper) and with a 10 second press, you will see the oils in your flower be extracted with simply heat and pressure. With any dab tool, you can easily gather up the extracted, fresh squeezed oil and vape it, load it on a bowl, enhance a joint, or even cook with it. With the Tarik Rosin, you can control your own medicine and know that it is truly solventless...no butane...no propane...no co2....simply your super dank flower rearranged...yeah science, b#!ch!